Everyone knows that being prepared requires having your own food source, both fresh and stored. Growing a nutritious garden in a very small space is an art and a science that every prepper should know how to do. Follow these simple steps and you will have abundant food for your entire family from less than 10 square feet. Imagine a garden that takes up very little space, but grows five times more food per square inch than a traditional garden. Imagine producing 100% organic, 100% Non-GMO food for your family in an extremely small space. You can have the most nutrient-dense vegetables on earth in less than 2 weeks on your window-sill. 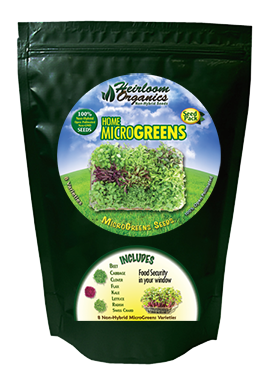 Most preppers know that micro-greens and baby greens are the most nutrient-dense vegetables you can grow. But their greatest feature is the minimum time and space required to grow them. 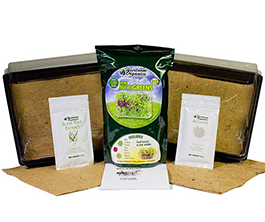 All you need is seeds, trays and plant nutrients and you can have a Micro-Garden today. The most important factor in an in-ground garden is root depth. The deeper your roots are the closer you can put plants together, because they are able to seek nutrients downward instead of outward. This simple method of creating greater root depth is called double-digging and quite simply that’s what it is. Dig your dirt twice as deep as you normally would (at least 3 feet). When you return the dirt to its hole make sure it stays fluffy not compacted and never step or put your body weight on that patch of dirt. Deep roots want fluffy dirt. You can now plant your vegetables much closer together and they will grow fantastically! Vertical gardening is an amazing way to get maximum production from the smallest spaces. Vertical gardening uses the roots for nutrition and water but walls, fences, trellises, roofs, windows and other vertical spaces as the growing space. This achieves maximum production from the smallest possible space. Follow these simple steps to take full advantage of your small–space garden. Choose your garden location well, with vertical gardening in mind. Make sure you have a lots of vertical space above your ground or pot-based garden. Choose vining varieties when possible. Peas, beans, cucumbers, squash, vining spinach (Malabar), melons, etc. Make climbing trellises with string or wood as high as possible. Vertical gardening is an art and science in itself and any serious small-space gardener should take the time to study it. Use these simple methods and you too can be a survival gardener in less than 10 feet. This entry was posted in Information, Tips and tagged Square Foot Gardening. Bookmark the permalink. I love your products and the fact that you make vaults based on peoples needs. Fantastic company. For me the food issues have already caused some gluten and dairy problems. For the future generations im working hard to have safe food for them. I would ask if you could sell some empty vaults, as my fist vault is full and i orders specialty seed packages that will not fit in it. Could you sell them? How long do the seeds last? If we buy for survival times, we need to store them. During an emergency we won’t have the chance to order. I heard seeds only last a year. how long do seeds keep on your buckets?